Bunny pops Easter suckers are a double crisp pop. A smooth milk chocolate shaped bunny with a crisp and crunchy candy inside. 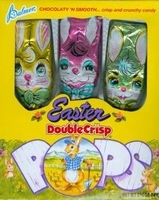 Each bunny pops is wrapped in a bright colored foil. You get 3 Easter suckers per box. Not only will kids be thrilled to find these suckers in their Easter baskets but there is also an Easter game on the back of the box. See who will be the first bunny to the golden Easter Egg and win.